RALEIGH — The Supreme Court of North Carolina will hold its May session of court at the Historic Burke County Courthouse in Morganton, N.C., on May 17 and 18. The Court will hear three cases on Tuesday morning and two cases on Wednesday morning. Due to limited seating, admission to these sessions of court is by ticket only. Tickets are free of charge and available to the public on a first-come, first-served basis at the Burke County Chamber of Commerce. This is the first time the court will travel to Burke County since the start of the Civil War. 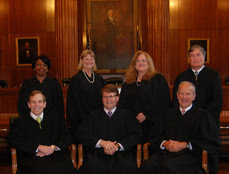 Chief Justice Mark Martin; Senior Associate Justice Robert H. Edmunds, Jr.; andAssociate Justices Paul M. Newby, Robin Hudson, Barbara Jackson, Cheri Beasley, and Sam Ervin IV (a native of Burke County). Open to credentialed media. Please RSVP via email to[email protected] and [email protected] if you plan to attend a case and if so, which one as your seat will need to be reserved. Oral argument for the first case on Tuesday will also be streamed live via WLOS, ABC 13 out of Asheville. Read more about the Supreme Court. The Mountain Laurel Quilt Guild will hold its Spring luncheon on Thursday, June 2nd, at 11:30 AM. We will meet at the Laurel Ford Baptist Church and install our new officers. Please bring finger food to share with the group. We will have a trunk show for our program. Directions: From Boone take 321 south to Aho Road and turn left. Go 1.8 miles and turn left onto Laurel Fork Church Road (there will be a sign on the right side of the road for the church). Go up the hill and the church will be on your left. From the Parkway turn on Aho Road, then right onto Friendship Church Road and left on Laurel Fork Church Road. The Church will be on your right. Call Dolores at 295-6148 for more information. Caldwell Community College and Technical Institute’s Small Business Centers in Caldwell County offers free and low-cost workshops, one-on-one assistance and many more services to help local small businesses. To reserve your seat at one of the workshops, call 828-726-2242 or visit www.cccti.edu/smallbusiness to register. Caldwell Community College and Technical Institute’s Caldwell Small Business Center will offer a free workshop titled “Small Business Bootcamp” from 6 p.m. to 9 p.m. on Wednesday, May 18 at the Caldwell County Chamber of Commerce in Lenoir. This course is geared towards those wanting to start their own business and is led by local entrepreneur and former Small Business Center Director David Waechter. The workshop covers the basics of getting your business off the ground and includes information on several topics including: How to name your business and why your business name is so important, registering your business with Secretary of State, how to obtain your LLC, Sole Proprietorship, or Incorporation, how to find the proper tax forms, how to obtain your tax ID or your EIN (Employer Identification Number) from the IRS, how to set up a business checking account and credit card, how to find what licenses and permits you need to get started, renting a space, easy and cost-effective marketing, sales and service and bookkeeping. This class will be offered again on Wednesday, June 15 from 6 p.m. to 9 p.m. at the Caldwell County Chamber of Commerce in Lenoir. To reserve your seat at either workshop, call 828-726-2242 or visit www.cccti.edu/smallbusiness to register. Caldwell Community College and Technical Institute’s Caldwell Small Business Center will offer a free workshop titled “Small Business Startup Series: How to Finance Your Small Business and Understand Business Finance” from 6 p.m. to 9 p.m. on Thursday, June 9 at the Caldwell County Chamber of Commerce in Lenoir. Participants will learn the various alternatives to financing a small business and the risks involved. The seminar introduces break-even analysis as a tool to assist the entrepreneur in measuring financial feasibility. Activities identify the kinds of data needed to project the revenue, start-up and operating costs of a business. The seminar helps attendees develop an understanding of cash flow and break-even analysis and its relationship to business planning. To reserve your seat at this workshop, call 828-726-2242 or visit www.cccti.edu/smallbusiness to register. Paws for a Cause is a FUN-draiser taking place in Newland to benefit the hard work that the Avery Humane Society does every day. All proceeds go to provide necessary supplies, medicine, treatments, love and shelter for Avery County’s animals in need. The Looking Glass Gallery in Appalachian State University’s Plemmons Student Union presents “Unrequited Contemplation,” an exhibition featuring work by Alissa Sauter. “Unrequited Contemplation” is on display through May 13. There will be a reception held onMay 13 from 4-5:30 p.m. at the Looking Glass Gallery. This event is free and open to the public. Sauter is one of only two senior studio art majors working towards a BFA that were afforded the Looking Glass to house their senior semester-long project. Sauter works primarily in earthworks. The art she created for this exhibition is made entirely out of local sticks and hot glue made especially for wood. Her installation work transforms the space into a serene landscape, with twisting and turning branches leading the viewer around the space. Her hope is for the viewer to find a “truth” similar to the truth that Sauter finds while creating this pieces. Sauter’s interest in meditation, as well as her influence and experience working with Patrick Dougherty, and a profound fascination with earthworks and land art, compelled her to submit her senior project to the Looking Glass. The gallery is one of the only spaces in Boone that can facilitate such an exhibition. The intimate space, in addition to the unique lighting from the floor, makes the space peaceful and immersive. Alissa Sauter was born in Covina, California. In 2013, she moved to Boone to pursue her Bachelor of Fine Art degree in studio art at Appalachian State University. Sauter is experienced in many mediums, but has developed a love for found mixed media sculpture and installation. A major theme that is explored in her work is the natural world and how humans interact with it. Sauter enjoys bringing found natural materials into the gallery space to influence how the viewer sees and experiences nature. Deeply intrigued by the meditative properties that the wilderness can exert, Sauter has developed her practice around the art of active meditation. With repetitive motions she intertwines branches and twigs to form movement in common undervalued natural objects. Sauter’s work has been viewed in different venues around Boone. Saturday 9 a.m. to 1 p.m., and Sunday noon to 11 p.m. The gallery exhibits, communicates, and supports the visual arts by offering students and the university the opportunity to become involved and experience artwork produced here at Appalachian.